Last night, we had quite a situation arise in our little home. You see, we live in a small townhouse, with one bathroom. When it came time to get Anna to bed, we went upstairs and discovered that somehow we were locked out of the bathroom. We were mostly glad that Anna wasn’t locked in it! After a half an hour of jimmying credit cards, bending hangers, taking apart a similar door handle and trying anything we could do to get the door open, I finally used my brute strength and opened the door. I cracked the door frame a bit – but at least we had access to a toilet and a shower! Today, the door handle and screwdriver from the events the night before were left on the floor, and Anna picked up the screwdriver and must have thought it was a magic wand. Funny – I don’t think she’s seen Harry Potter since the day she was born. (Literally – there was a HP marathon on TV at the hospital that weekend). Enjoy this video of Anna wielding her screwdriver wand! 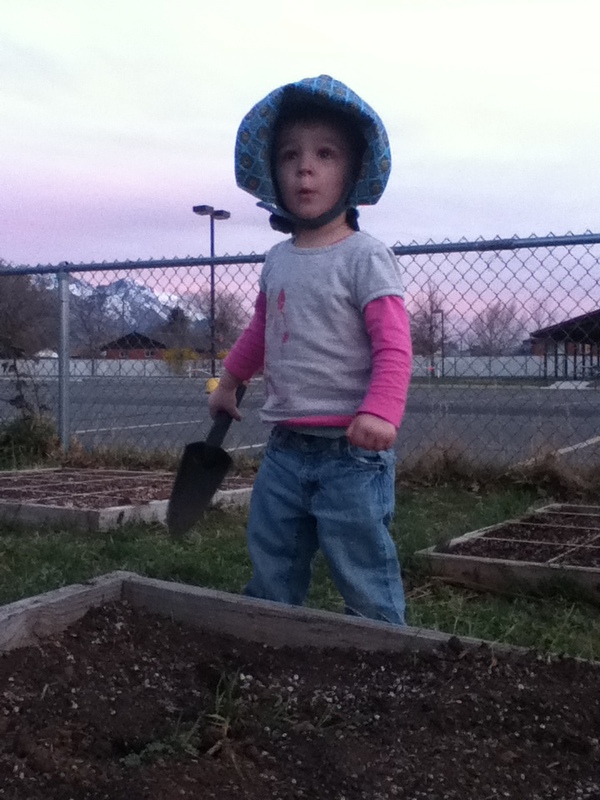 Tonight, after the sun set behind the mountains, we took Anna over to our neighbor’s yard where we have a small plot for square foot gardening. 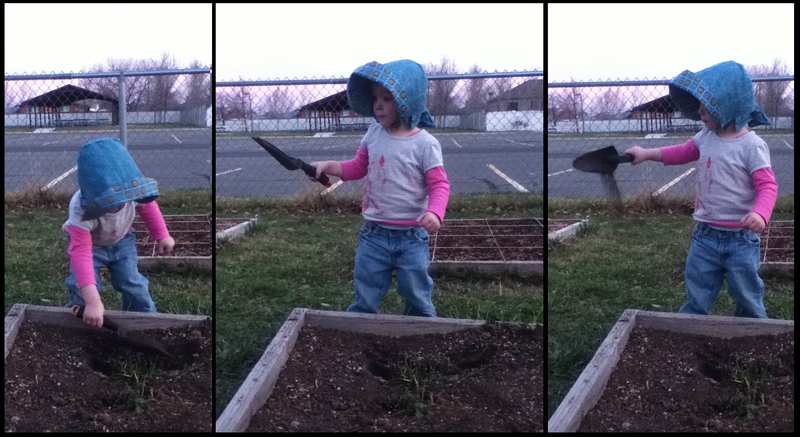 Anna really got into the work – shoveling the dirt from the grow box, and dumping it onto the grass. Luckily, we found a toy dump truck and persuaded Anna that the dirt should go into the truck, not on the lawn. She had a great time, but she was a just sad there weren’t any kids to play with -most of the neighbor kids had gone to bed already! Too bad for them – we’re the night owl family, and the fun starts at dusk! Spring is Here! Time to Play….Outside? Today was a rough one, but life is still pretty good. This afternoon, Anna brought Alyssa (our wonderful babysitter) her little shoes for help to put them on. Alyssa thought it was just to play, but she soon found out that “shoes” = time to go outside. But, of course, it was a still a sunny afternoon day and not a good time for Anna to go out. When I got home from work, Anna was really anxious to go outside. She stood at the window and just cried and cried . I got her stroller ready, complete with a UV-blocking plastic shield, and took her out for a stroll. Anna was thrilled to be out of the house and seeing the neighborhood dogs, birds, and people. When I took her stroller up to the front door so I could start making dinner, she got really upset – so we went for another trip around the block – this time our good neighbor Hilary brought out her tiny dog Rizzo to visit Anna. Rizzo even got inside Anna’s stroller with her! That scared Anna a bit, but she was excited to play with the dog. We finally went back in the house to make dinner. When Libby got home, the sun was going down, and she got to spend part of the evening with Anna, who was so happy to finally be outside. Libby posted on her facebook, “Now I’m home with my lovely girl playing on the back patio like she’s a big kid, and eating mac n cheese w/ hot dogs. Life is good :)” Now we’re both home, ready for the weekend, and glad to be together. This morning we were happy to have a great woman from Kids on the Move, a local child development program that helps young children and parents visit Anna and evaluate her development. Anna did a great job! She successfully played with the toys the right way, recognized pictures, and basically impressed the worker. I was such a proud dad. The only place that Anna was midly behind was in language development, because she’s not saying quite as many complete words as some her age, but her pre-language is coming along just fine. And we were given some great ideas to help Anna’s language come along. 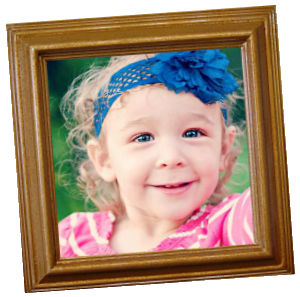 It’s a relief to know that Anna’s cognitive development is not delayed – one more miracle! We’re grateful her XP isn’t affecting her development. I know that Heavenly Father is watching over our special little girl. On Thursday’s episode of Anderson, a new daily talk show starring Anderson Cooper, Michelle Milota, her husband, and her daugter Aimee (who has XP) were interviewed. Watch a clip of the interview here. After the frightening weekend with Anna, we had pictures of Anna’s sunburn sent out to a team of doctors and researchers at the National Institutes of Health located just outside of Washington, D.C. After examining the photos and considering my sister’s history with XP, they thought it wise to have us bring Anna for testing to their campus in Bethesda, Maryland. We packed our bags and flew to Maryland in August 2011. We checked in at a wonderful facility called The Children’s Inn, which is located on the NIH campus. They house, feed, and entertain young patients and their families who are being examined at the NIH. 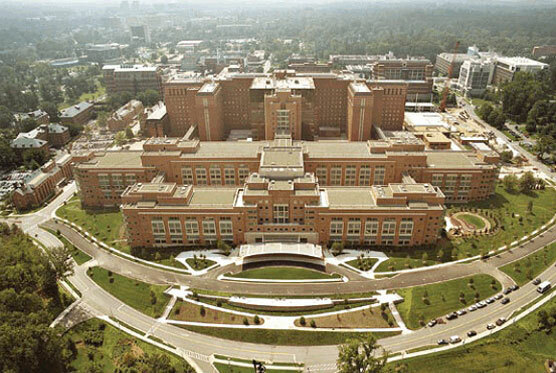 We checked in to the enormous central building of the NIH campus on the night we arrived, and got up early the next morning to begin testing. 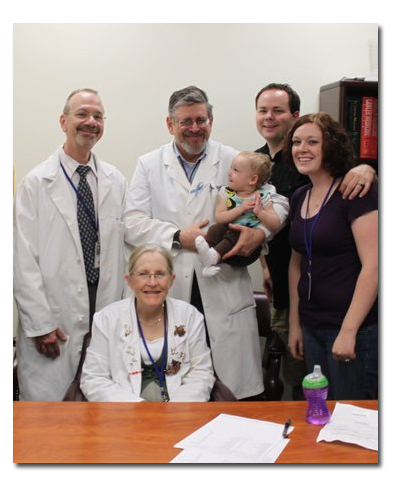 We were treated with care and respect by the great team of doctors involved with the XP study. They took small biopsies from all of us, tested our blood, and examined our skin. Anna was examined by a neurologist, an opthamologist, an audiologist, and more. 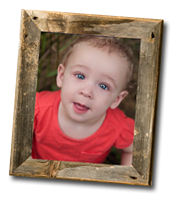 We were pleased to discover that Anna’s hearing, vision, and development were coming along just fine. The doctors did suspect that Anna had XP, based on the burns and family history. However, the diagnosis could only be made after months of research on her DNA. These incredible doctors devised a way to test the DNA repair gene process to figure out what part of the repair process doesn’t work correctly in an XP patient. 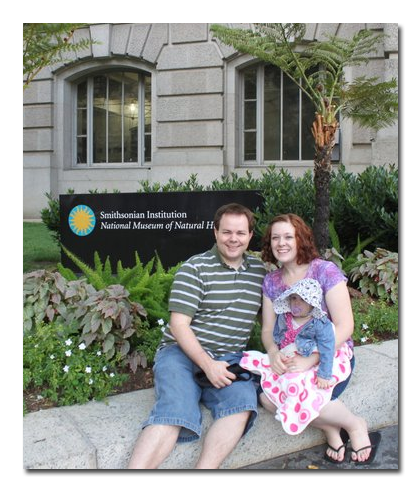 We took advantage of being so close to our nation’s capitol and took trips to see the Smithsonian museums and many more sites. Anna’s favorite was the natural history museum – she loves anything with fur. It was a great trip and we were grateful that Anna could be part of the study. Several months after we returned home, we recieved confirmation that Anna does indeed have XP. Type D, to be specific. 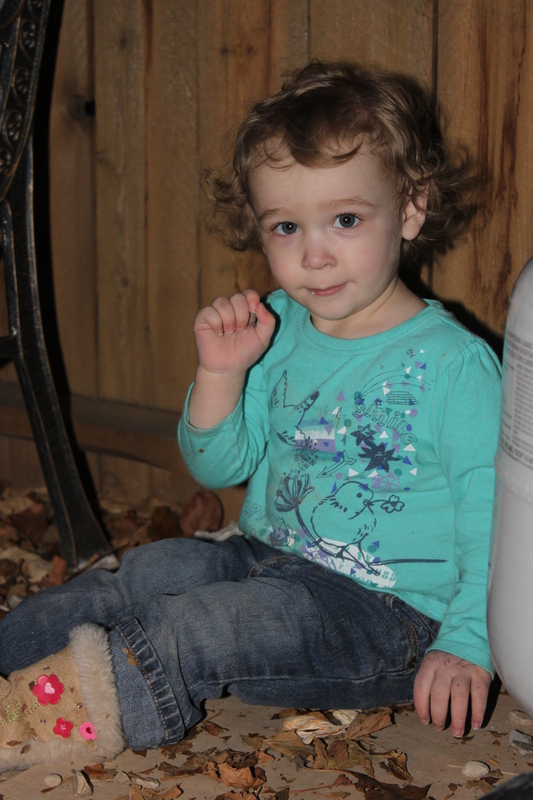 We are grateful to know that Anna’s neurological development will most likely continue normally. We are so blessed to have this diagnosis early so we can keep Anna safe from harmful UV rays. 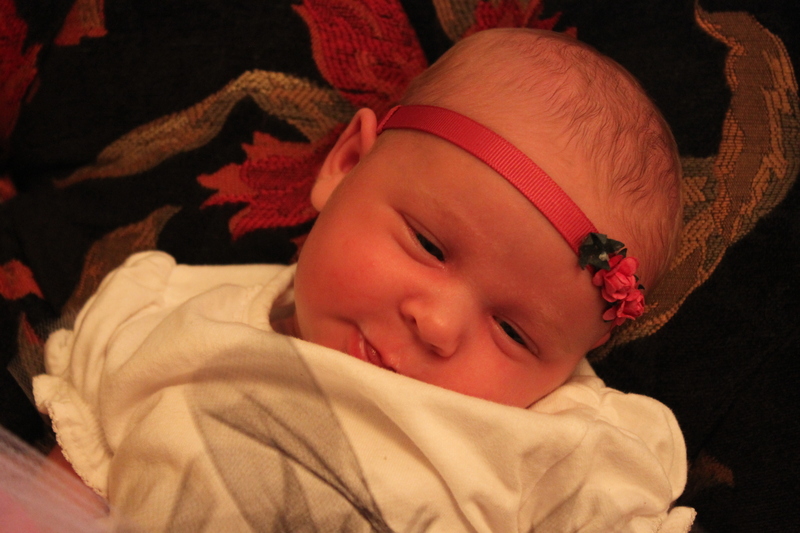 Back in May 2011, we had a frightening weekend that changed our lives. I wrote about it on facebook and in an email to friends. I thought I’d share it here. I’ve updated it a bit and added some relevant photos. Last summer, Anna got a bad sunburn on an overcast day outside the temple at her aunt’s wedding. Anna was only 4 weeks old, and because of the cloud cover we didn’t think sunblock was necessary. Taken not long after Anna’s first sun exposure. The next day, it was heartbreaking to see that she had been badly burned. Her tender new face began to blister and peel. We worked hard to keep her out of the sun the rest of the summer. This spring we’ve had several beautiful sunny days in between the rain and snow – and even though we’ve used sunscreen (most of the time) Anna’s still gotten a little red under her eyes with sunburn. Sometimes we thought it was just an allergic reaction to sunscreen in her eyes. On Saturday, we took Anna with Libby’s family to the Zoo. Anna absolutely loves animals and waved her arms with excitement anytime she saw something furry or feathered moving around. We slathered her in sunscreen a couple of times, and thought we did a good job keeping her in the shade, keeping her hat on, and keeping her in the stroller covered up. But four hours at the zoo on a very sunny day was still too much. Grammy re-applying Anna’s sunblock halfway through our day at the zoo. The next day (Sunday) she was red under her eyes again and we could tell she was it pain from it. On top of that we think she’s teething too! We gave her infant Tylenol and that seemed to help a bit, but not enough. She woke up every half hour through the night crying, and only slept when in our arms. On Monday morning her eyes were swollen and she wouldn’t open them. Now a side note: Many of you know that my sister Lizzie has a syndrome called “XP.” Basically, her skin is extremely sensitive to sunlight and uv rays, and her cells aren’t able to repair from UV damage. She needs to stay out of sunlight 100% of the time, or completely cover her skin and wear a protective plastic shield over her face when in the sun. There is no cure, and it’s very, very rare. 1 in 250,000 or something like that. Because of Anna’s obvious sensitivity to the sun, we have been concerned she might have XP, even with how rare it is. We decided to take her to a local doctor that is familiar with Lizzie and with XP. When we arrived around 1:30, Anna finally opened up her eyes. During the quick visit, the doctor more or less said “Let’s worry about her skin later. I’m really worried about her eyes, and I hope she’s not blind now.” She called an ophthalmologist at a large local children’s hospital and had us run out the door and drive straight there. As you can guess, it was a horrible drive thinking we may have blinded our child for life. The good doctor at the children’s hospital was able to look at Anna’s eyes and conclude that there was no damage to her eyes or vision from this recent sunburn. THANK GOODNESS. Anna can see just fine, but she is still a little light sensitive and her eyes are still burned, red and puffy. We’re giving her acetaminophen and ibuprofen and she’s feeling more like her normal self as her sunburned eyes heal over the next several days. Meanwhile, we’re still concerned about the XP possibility. The local doctor is sending photos of Anna’s burns to the National Institute of Health in Washington D.C. where they will examine them. We’re not positive what may happen next, but if they suspect XP we’ll probably need to send in a blood test, or get a DNA sample, or have a geneticist have a look. It could be many months before we know anything. In the meantime, we’re going to be extra cautious and treat Anna like she does have XP – meaning no sunlight, ever. Thanks to Lizzie, we have knowledge and tools on how to do that. And if Anna does have XP, it will be a miracle to bee able to know at such a young age, and we’ll be able to keep her healthy and happy for a long healthy life. But here’s hoping she’s just really sensitive to the sun.